Starring Melissa George who is known for being in Home and Away and horror of dubious quality, now steps into the lead of a thriller. From the trailer it does seem to be a well crafted film but isn't that what I am meant to get from the trailer? 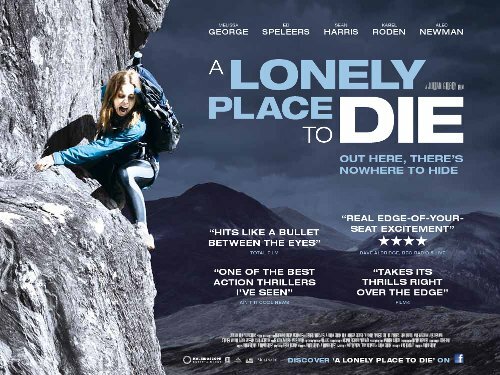 A group of five mountaineers lead by Alison (Melissa George) are hiking and climbing in the Scottish Highlands practising for a more dangerous ascent of the Eiger later in the year. On the second day of their trek one of the climbers in the group, Ed (Ed Speleers) hears a noise. The group follow the sound and discover an air-pipe sticking out of the ground. They can hear the cries of a person from beneath the earth and soon discover an eight year old girl buried in a small chamber. She is terrified, dehydrated, half-starved and can’t speak a word of English. The group decide to rescue the girl and in their efforts to get her to safety they find themselves being pursued by the girl’s kidnappers, ruthless killers who will stop at nothing to take back the girl. An adrenaline fuelled chase ensues, set against the backdrop of the most remote wilderness, amongst the wildest river rapids and on the rock faces of the most terrifying terrain. Every one of the group is going to have to fight for their lives if they want to make it out alive. Frightening, uncompromising and brutally realistic: this is the ultimate British pursuit thriller.